(CNN) -- Fourteen city workers and one retired city worker in the western Ohio town of Piqua claimed a $207 million 12-state lottery prize Wednesday. After five years of buying Mega Millions Lottery tickets, a group of 15 people in Ohio finally hit the jackpot. The workers posed for pictures behind an oversized replica of the check, smiled for photographers and described their plans, which range from buying a new truck to quitting a job and traveling. 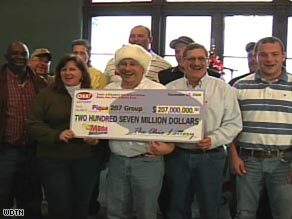 As they had done twice a week for the past five years, the group pooled their money to buy Mega Millions Lottery tickets. "I'm going to set my mom and dad up for life," said Loyal Davis, who bought the lottery ticket and then got the job of telling his co-workers they had won. One of them was his father-in-law, Tom Hill. "He goes, 'You won't believe it,' " Davis recalled. " 'Somebody hit the lottery at Kroger's in Piqua.' "
"You're kidding," Davis said he responded. Then Hill asked what he would do if he won. Davis took out the ticket. "Here you go, Tom, you're a millionaire," he recalled saying. Hill erupted with excitement. His wife, Brenda, began crying. Davis said he plans to continue working for the street department, where he has been employed for more than eight years. "I love my job," he said. Asked if he is worried that his sudden change in financial status could have a negative effect, he said, "I hope not." "I'm always happy and positive, and I don't want no negativity," he said. "I hope nothing negative comes out of this. I think I got a good head on my shoulders to hopefully not let that happen." But he does plan to make a few changes. "The first thing I'm going to buy I've never had: a brand-new vehicle," Davis said. Amos Steinbrunner, 30, who's the youngest of the winners, said he had not yet figured out what to do with his winnings beyond helping his father retire. "Right now, I'm in shock and surprised, and I don't know what it really means to me right now," said Steinbrunner, who has been working at the job just two months and plans to marry in April. "I'm going to take it day by day and see how everything goes." But the potential effect of the event was not lost on him. "It can change all my family's lives, and it means a lot," he said. Cindy Hershberger said she plans to give some of her money to her mother, who is retired. "It was wonderful to call and say, 'Mom, I'm buying you a house,' " she said. "It's a great feeling to know that you can help people." Now, at age 45, Cindy is planning to retire, too. The decision was not a difficult one, she said. "I like my job, I really do. I love my job, but there are other things." She said she will spend time with her children and mother, and will be doing volunteer work, traveling with her boyfriend "and just relaxing." The winnings will not be divided evenly -- one of the winners paid for two tickets.